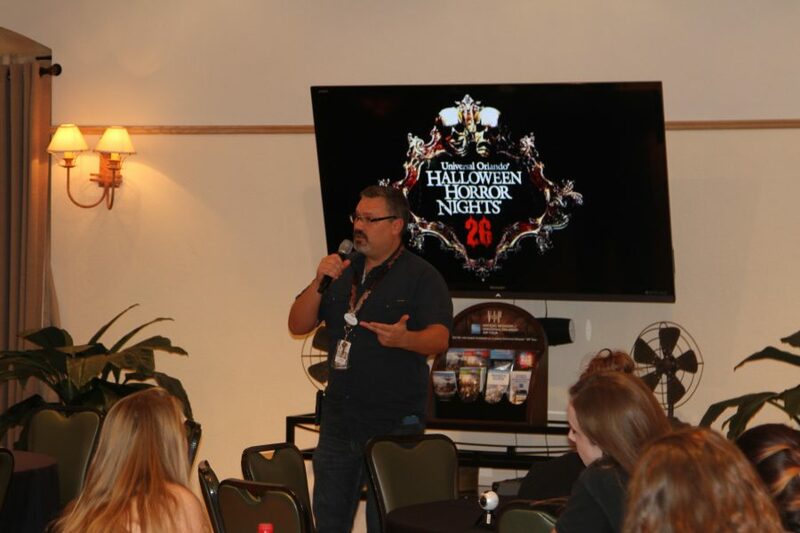 Charles Gray, show director, shares some of HHR 26 secrets with journalists. Halloween Horror Night 26 unleashed the fear to the media in early September. With creepy clowns running amuck in the US, Jack the clown’s sidekick “Chance” warns visitors “You won’t stand a chance”. The houses are a mix of old favorites like Texas Chainsaw Massacre and Halloween II, and new scares such as Krampus, Lunatics Playground 3D and American Horror Story. With nine houses, it is the largest maze of scares yet. The Walking Dead returns this year, but with a new twist. According to show director Charles Gray, it is a compilation of the best scenes throughout the six seasons. Fans won’t be disappointed by the incredible display of zombie gore and a glimpse of the some of the more famous walkers from each season. Krampus is a “must visit” house. Even if you are not a fan of the film, Christmas, killer elves and the smell of ginger in the air give this maze an unparalleled appeal. Besides, who doesn’t want to “take” a scare rather than “give” one before Christmas? Lunatics Playground, American Horror Story and the Exorcist round out the “must visit” list. Texas Chainsaw Massacre, Halloween II, Ghost Town: The Curse of Lightning Gulch and Tomb of the Ancients are also worth the wait, but with nine mazes and five scare zones, it’s hard to squeeze in all in one visit. Hence, get the “Frequent Fear” pass and you won’t be disappointed!